Worldwide, leflunomide is a commonly used Disease-Modifying Anti-Rheumatic Drugs (DMARDs). It can be used as a monotherapy or in combination with other DMARDs to inhibit the production of inflammatory cells and accordingly reduce inflammation. CLEAR is a multi-centric study that aims to assess the clinical efficacy and safety of leflunomide as first-line and/or add-on therapy to other DMARDs with or without steroids in Egyptian patients with active Rheumatoid Arthritis (RA). Egyptian patients with active RA for whom leflunomide was prescribed at physicians’ discretion were observed for 12 weeks. Clinical Disease Activity Index (CDAI) score, and Health Assessment Questionnaire Disability Index (HAQ-DI) score were acquired thrice during this period. This study was registered on clinicaltrials.gov (NCT03599986). Interim analysis of the data collected from 337 patients (in 21 centers) showed a statistically significant decrease in the mean total CDAI score throughout the first 12 weeks of treatment (p<0.001); as the mean ±SD score decreased from 36.60 ±14.90 at baseline to reach 16.16 ±9.84 at week 12 (% reduction: 61.16 ±14.36). A statistically significant decrease (p<0.001) was also observed in HAQ-DI, as the mean ±SD score decreased from 1.46 ±0.69 at baseline to reach 0.67 ±0.54 at week 12 (% reduction: 56.11 ±27.59). Results of the interim analysis suggest that treatment of Egyptian patients with active RA with leflunomide (as first-line and/or add-on therapy to other DMARDs with or without steroids) for 12 weeks may be effective in terms of CDAI score and HAQ-DI score reduction and may offer an alternative for patients who experienced resistance, inadequate response or intolerance to other DMARDs. Keywords: Rheumatoid Arthritis, DMARDs, Leflunomide, CDAI, HAQ-DI, Egypt. © 2018 Adel El Sayed. Rheumatoid Arthritis (RA) is a systemic, chronic and inflammatory disease where there is an immune mediated inflammation of the attacks the body and affects joints, muscles, tendons, connective tissues and fibrous tissues [1Ignatavicius D, Workman M, Rebar C. Medical-surgical nursing: Concepts for Interprofessional Collaborative Care 9th ed. 9th ed.2017.]. It causes pain, disability and increased mortality for the affected population [2Heidari B. Rheumatoid Arthritis: Early diagnosis and treatment outcomes. Caspian J Intern Med 2011; 2(1): 161-70. [PMID: 24024009] ]. RA is considered to be one of the most common autoimmune diseases in adults affecting approximately 1% of the global population and 0.3% of the Egyptian population [3Rudan I, Sidhu S, Papana A, et al. Global Health Epidemiology Reference Group (GHERG). Prevalence of rheumatoid arthritis in low- and middle-income countries: A systematic review and analysis. J Glob Health 2015; 5(1): 010409. [http://dx.doi.org/10.7189/jogh.05.010409] [PMID: 25969732] , 4Usenbo A, Kramer V, Young T, Musekiwa A. Prevalence of arthritis in Africa: A systematic review and meta-analysis. PLoS One 2015; 10(8): e0133858. [http://dx.doi.org/10.1371/journal.pone.0133858] [PMID: 26241756] ]. During the past 30 years, RA management has drastically changed as few therapeutic agents were extant. At the present time, numerous treatments are used in managing the disease; this involves two approaches; the first is modification of the disease process where radiological progression of the disease can be slowed or stopped, the second is relieving the related signs and symptoms [5Singh JA, Saag KG, Bridges SL Jr, et al. 2015 American college of rheumatology guideline for the treatment of rheumatoid arthritis. Arthritis Rheumatol 2015; 68(1): 1-26. [http://dx.doi.org/10.1002/art.39480] [PMID: 26545940] , 6Smolen JS, Landewé R, Bijlsma J, et al. EULAR recommendations for the management of rheumatoid arthritis with synthetic and biological disease-modifying antirheumatic drugs: 2016 update. Ann Rheum Dis 2017; 76(6): 960-77. [http://dx.doi.org/10.1136/annrheumdis-2016-210715] [PMID: 28264816] ]. Even with the current high number of biological targeted therapies, methotrexate (MTX) remains to be the gold standard for treatment of RA [7Shinde CG, Venkatesh MP, Kumar TM, Shivakumar HG. Methotrexate: A gold standard for treatment of rheumatoid arthritis. J Pain Palliat Care Pharmacother 2014; 28(4): 351-8. [http://dx.doi.org/10.3109/15360288.2014.959238] [PMID: 25322199] ]. In 2016, The European League Against Rheumatism (EULAR) recommended that MTX should be a part of the first-line treatment. However, leflunomide or sulfasalazine was recommended as part of the first treatment strategy in patients with a contraindication to MTX or with early intolerance [6Smolen JS, Landewé R, Bijlsma J, et al. EULAR recommendations for the management of rheumatoid arthritis with synthetic and biological disease-modifying antirheumatic drugs: 2016 update. Ann Rheum Dis 2017; 76(6): 960-77. [http://dx.doi.org/10.1136/annrheumdis-2016-210715] [PMID: 28264816] ]. Leflunomide is a modified type of DMARDs (an isoxazole derivative and inhibitor of de novo pyrimidine synthesis) that reduces inflammatory cells leading to suppressing inflammation and modifies the underlying immune response with improved tolerability [8Jones PB, White DH. Reappraisal of the clinical use of leflunomide in rheumatoid arthritis and psoriatic arthritis. Open Access Rheumatol 2010; 2: 53-71. [http://dx.doi.org/10.2147/OARRR.S9448] [PMID: 27789998] ]. In a number of studies conducted to investigate the efficacy and safety of leflunomide in RA management, leflunomide was found to be equivalent to MTX and its safety profile was acceptable compared to other DMARDs. It was also found that leflunomide was superior to MTX in terms of quality of life measurements [8Jones PB, White DH. Reappraisal of the clinical use of leflunomide in rheumatoid arthritis and psoriatic arthritis. Open Access Rheumatol 2010; 2: 53-71. [http://dx.doi.org/10.2147/OARRR.S9448] [PMID: 27789998] -10Fox R, Helfgott S. Leflunomide in the treatment of rheumatoid arthritis and other autoimmune disorders. APLAR J Rheumatol 2004; 7(1): 71-8. [http://dx.doi.org/10.1111/j.1479-8077.2004.00057.x] ]. The aim of CLEAR study is to assess the clinical efficacy and safety of leflunomide as the first-line therapy and as add-on therapy to other DMARDs (such as MTX, hydroxychloroquine, sulfasalazine) with or without steroids in Egyptian patients with active rheumatoid arthritis. Patients were included in this study by rheumatologists from 21 sites across Egypt. To avoid potential bias, consecutive recruitment was considered. Adult male and female patients with active RA (selected according to the ACR/EULAR classification 2010 criteria with score ≥ 6 points) who were leflunomide naïve or with previous leflunomide administration (after at least a 6 month wash-out period before date of baseline visit) and who were prescribed leflunomide at the sole decision of the treating physician were included in the study. Patients were excluded from the study entry if they met one or more of the following criteria; 1) Female patients who were pregnant or lactating at the time of inclusion or those who were planning for pregnancy within the coming year from the time of inclusion to the study, 2) Contraindications to leflunomide, 3) History of non-treated hepatitis B &/or C infection, 4) History of severe liver disease (child C class), 5) History of severe renal insufficiency (creatinine clearance ≤30 ml/min. ), and 6) Severe concurrent infection (necessitating IV antibiotics or hospitalization). This is a phase IV, multi-centric, prospective, observational study. The total study duration is planned to be one year; three months for recruitment and nine months for treatment and observation. Patients with available data at the 3rd month (after 12 weeks from signing informed consent) were included in the interim analysis. Data about patients’ demographics, physical examination, vital signs, medical history, concomitant medications, RA disease status, obstetric and gynecological history (for female patients only) were collected along with CDAI score, and HAQ-DI score, that were acquired thrice during this period. Data about RA disease history and current status, and reasons for prescribing leflunomide were also collected, as well as Adverse Events (AEs) and serious adverse events (SAEs). The primary objective of CLEAR study is to assess the clinical efficacy of leflunomide as first-line therapy and as add-on therapy to other DMARDs (such as MTX, hydroxychloroquine, sulfasalazine) with or without steroids as measured by the mean relative change in CDAI score and HAQ-DI score among patients with active RA in Egypt. The secondary objectives are; evaluating the safety of leflunomide that was assessed by the frequency of AEs/ SAEs in the same population, and describing the pattern of management and characteristics of Egyptian patients with active RA receiving leflunomide. Statistical analysis was performed with Statistical Package for the Social Sciences (SPSS), version 17.02 (SPSS, Chicago, IL). Per cent distribution for all categorical variables and mean with (SD) were calculated for continuous variables. Wilcoxon signed rank test was used to check for statistical significance of CDAI score and HAQ-DI score changes. P values less than 0.05 were considered to be statistically significant. Considering an alpha error of 5% using two-sided 95% CI of Wilcoxon signed-rank test and a study power of 80%, a sample of 332 patients was required to detect an effect size of 0.158 between baseline and study endpoint, plus an expected drop-out rate of 20% during the 9-month observational study duration. Thus, a sample of 398 patients was considered to be appropriate, that rounded to 400 patients. Till January 2018, a total of 337 patients were recruited in 21 sites across Egypt. 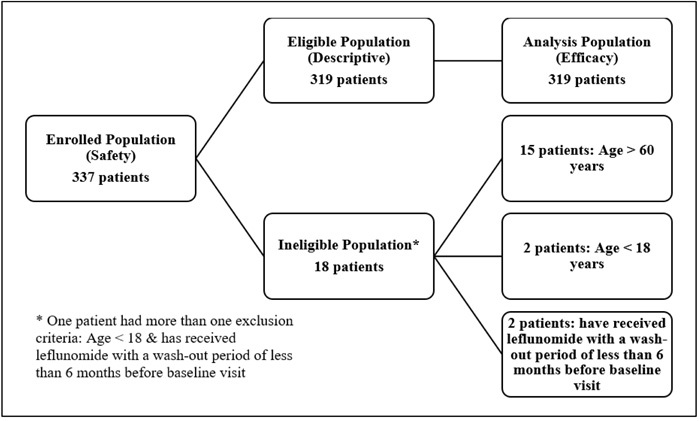 Eighteen patients were excluded from the study; 15 aged more than 60 years, two aged less than 18 years, and two have previously received leflunomide with a wash-out period of less than 6 months before baseline visit (Fig. 1 ). In regards to patients’ distribution across Egypt, out of the 337 enrolled patients, 35% were recruited from six sites in Delta, 32.9% were recruited from nine sites in Greater Cairo, 30.3% were recruited from five sites in Alexandria, and only 1.8% were recruited from one site in Upper Egypt. The eligible population consisted of 319 patients with a mean ±SD age of 44.14 ±9.85years, mean ±SD weight of 82.51 ±15.86 kg, mean ±SD height of 164.33 ±6.06 cm, and mean BMI ±SD was 30.56 ±6.66 kg/m2. The vast majority of patients (84.9%) were women. The mean ±SD value for systolic blood pressure (SBP) was 122.53 ±13.63 mmHg while for Diastolic Blood Pressure (DBP), it was 78.41 ±9.15 mmHg. Most of the patients (89.3%) had normal physical examination outcome. Detailed baseline characteristics are listed in Table 1. Around one third of the eligible population (104, 34.3%) are living with comorbidities, of whom; 30.09% are suffering from cardiovascular disorders, 11.9% have obesity, 8.15% have musculoskeletal disorders, 7.5% have diabetes mellitus type 2, 3.8% have gastrointestinal disorders, and 3.5% are suffering from dyslipidemia. Regarding concomitant medication, the majority (76.3%) did not report receiving medications other than RA treatments, while 23.7% were receiving medications for co-existing conditions. At baseline, the severity of RA was assessed by patients’ CDAI score; 81.8% of patients had CDAI score higher than 22 points indicating high disease activity, 15.6% had CDAI score between 10 and 22 points indicating moderate disease activity, while 2.61% had CDAI score between 2.8 and 10 points indicating low disease activity. Data about RA history and previous leflunomide administration were collected. The mean ±SD duration of RA since diagnosis was 3.92 ±5.13 years. 11.3% of patients received leflunomide in the past, with 39.7% of them received leflunomide loading dose (100 mg orally once a day for 3 days). The most frequently reported RA therapy (previously prescribed) was MTX as reported by 179 (56.11%) patients, followed by hydroxychloroquine (148, 46.39%), corticosteroids (105, 32.92%), sulfasalazine (42, 13.17%), and NSAIDs in 12 (3.76%) patients. 25.4% of the eligible population reported experiencing either AEs or SAEs during their previous RA treatment. In regards to RA current status and leflunomide administration at the time of baseline visit, loading dose was prescribed for 202 (69%) patients, while maintenance dose (20 mg once daily) was prescribed for 91 (31%) patients. This included 64 (21.9%) received leflunomide as first-line therapy, 100 (34.2%) received leflunomide as add-on therapy to other DMARDs without steroids, and 128 (43.8%) received leflunomide as add-on therapy to other DMARDs with steroids. Insufficient response to previous therapy was found to be the most frequent reason for starting leflunomide treatment as reported in 46.7% of the eligible population, followed by intolerance to previous therapy in 14.4%, previous DMARDs failure in 5%, and allergy to previous treatment in 1.3%. A statistically significant decrease (p<0.001) was observed in the mean ±SD CDAI total score; from 36.60 ±14.90 at baseline visit to 20.6 ±10.73, with a mean reduction of 17.33 ±11.92, after 6 weeks from treatment initiation (% score reduction: 44.7 ±24.12%). It was further decreased to reach 16.16 ±9.84, with a mean reduction of 24.41 ±10.62, after 12 weeks from the same time point (p<0.001) (% score reduction: 61.16 ±14.36%)(Fig. 2 ). 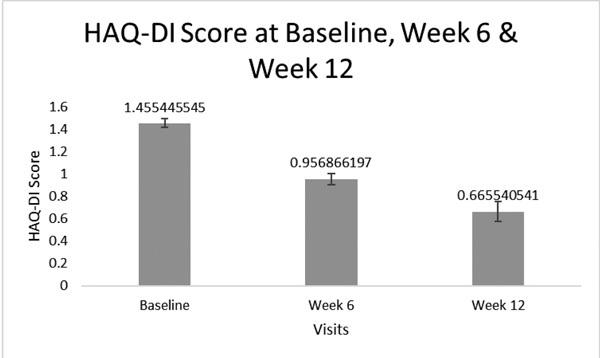 CDAI score at baseline, week 6 & week 12. In regards to patients receiving leflunomide as a first-line therapy, the mean ±SD CDAI total score was significantly decreased (p<0.001) from 35.40 ±16.49 at baseline visit to reach 15.04 ±9.63 after 6 weeks from treatment initiation, however after additional 6 weeks, the mean ±SD CDAI total score was insignificantly decreased (p=0.028) to be 11.83 ±5.88. In patients receiving leflunomide as add-on therapy to other DMARDs with or without steroids, the mean ±SD CDAI total score was significantly decreased from 37.09 ±14.12 at baseline visit to reach 20.42 ±9.36 after 6 weeks from treatment initiation. Unlike patients receiving leflunomide as a first line therapy, in this group, the mean ±SD CDAI total score was significantly further decreased to reach 15.98 ±10.32 after an additional 6 weeks. As for HAQ-DI, the mean ±SD score was significantly decreased (p<0.001) from 1.46 ±0.69 at baseline visit to reach 0.96 ±0.60, with a mean reduction of 0.46 ±0.39, after 6 weeks from treatment initiation (% score reduction: 33.27 ±30.36). This was followed by a further decrease to reach 0.67 ±0.54, with a mean reduction of 0.76 ±0.5, after 12 weeks from the same time point (p<0.001) (% score reduction: 56.11 ±27.59)(Fig. 3 ). HAQ-DI score at baseline, week 6 & week 12. Concerning patients receiving leflunomide as a first-line therapy, the mean ±SD HAQ-DI score was significantly decreased from 1.35 ±0.73 at baseline visit to reach 0.82 ±0.63 after 6 weeks from treatment initiation, however, after an additional 6 weeks, the mean ±SD HAQ-DI total score was insignificantly decreased (p=0.027) to be 0.42 ± 0.38. In patients receiving leflunomide as add-on therapy to other DMARDs with or without steroids, the mean ±SD HAQ-DI score was significantly decreased from 1.50 ±0.67 at baseline visit to reach 0.95 ±0.58 after 6 weeks from treatment initiation. Unlike patients receiving leflunomide as a first-line therapy, in this group, the mean ±SD CDAI total score was significantly further decreased to reach 0.65 ±0.56 after an additional 6 weeks. Data from safety population (N=337) was included in this analysis. One adverse event, hepatic enzyme increase, was reported during the first 12 weeks of the study duration (incidence rate 0.2%). As per the 2016 EULAR updated recommendations, treatment of RA should aim to provide the optimum care for patients, and should be based on disease activity, patient’s structural damage progression, comorbidities and safety issues [6Smolen JS, Landewé R, Bijlsma J, et al. EULAR recommendations for the management of rheumatoid arthritis with synthetic and biological disease-modifying antirheumatic drugs: 2016 update. Ann Rheum Dis 2017; 76(6): 960-77. [http://dx.doi.org/10.1136/annrheumdis-2016-210715] [PMID: 28264816] ]. Although few studies have been conducted to investigate RA in Egypt, no studies were dedicated to evaluate the safety and efficacy of leflunomide. The CLEAR study is considered to be the first study to assess both clinical efficacy and safety of leflunomide in Egyptian RA patients [11Gamal R, Mahran S, Abo El Fetoh N, et al. Quality of life assessment in Egyptian rheumatoid arthritis patients: Relation to clinical features and disease activity. Egyptian Rheumatologist 2016; 38(2): 65-70. [http://dx.doi.org/10.1016/j.ejr.2015.04.002] -13Abou El-Soud AM, El-Najjar AR, El-Shahawy EE, et al. Prevalence of juvenile idiopathic arthritis in sharkia governorate, Egypt: Epidemiological study. Rheumatol Int 2013; 33(9): 2315-22. [http://dx.doi.org/10.1007/s00296-013-2707-2] [PMID: 23512174] ]. Although the observation period is still ongoing, preliminary data analysis was performed and we found that; in terms of efficacy, the mean ±SD CDAI score was significantly (p<0.001) reduced after 12 weeks from leflunomide treatment initiation. This was found to be consistent with results from a prospective study that evaluated the efficacy of leflunomide in an Indian group of patients where the mean ±SD CDAI score was significantly reduced from 43.27 ±15.9 at baseline to reach 17.94 ±16.3 (p<0.001) after 12 weeks of treatment [14Mathur R, Singh H, Arya S, et al. Comparative evaluation of efficacy of leflunomide versus combination of methotrexate and hydroxychloroquine in patients of rheumatoid arthritis–An Indian experience. Indian Journal of Rheumatology 2016; 11(2): 86-90.]. In regards to the mean ±SD HAQ-DI score, it was significantly (p<0.001) reduced after 12 weeks from leflunomide treatment initiation, while in another study conducted by Kellner H et al., the mean ±SD HAQ-DI score was reduced from 1.37 ±0.7 to reach 0.95 ±0.69 after 12 weeks of leflunomide treatment (p<0.001) [15Kellner H, Bornholdt K, Hein G. Leflunomide in the treatment of patients with early rheumatoid arthritis: Results of a prospective non-interventional study. Clin Rheumatol 2010; 29(8): 913-20. [http://dx.doi.org/10.1007/s10067-010-1425-3] [PMID: 20496042] ]. In terms of safety, out of the 337 enrolled patients, only one patient (0.2%) experienced hepatic enzyme increase. In a study conducted by Cutolo M, hepatic enzyme increase was also reported (in 4.9% of patients) along with diarrhea, vomiting, alanine aminotransferase increase, alopecia and headache [16Cutolo M, Bolosiu H, Perdriset G. Efficacy and safety of leflunomide in DMARD-naive patients with early rheumatoid arthritis: Comparison of a loading and a fixed-dose regimen. Rheumatology (Oxford) 2013; 52(6): 1132-40. 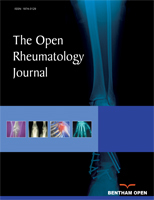 [http://dx.doi.org/10.1093/rheumatology/kes321] [PMID: 23401601] ]. We are also aiming to describe the pattern of RA management in Egyptian patients receiving leflunomide. We found that the majority of patients (78%) received leflunomide as add-on therapy to other DMARDs with or without steroids, while 21.9% received leflunomide as first-line therapy. In regards to leflunomide dose at baseline, 69% of patients received a loading dose of 100 mg orally once a day for 3 days, while 31% received a dose of 20 mg once daily. These findings were found to be matching with current treatment guidelines stating that RA management should start with a monotherapy, commonly MTX, and with a combination of DMARDs in patients with high disease activity, poor prognostic factors, previous treatments resistance, inadequate response or intolerance [17Wijesinghe H, Galappatthy P, de Silva R, et al. Leflunomide is equally efficacious and safe compared to low dose rituximab in refractory rheumatoid arthritis given in combination with methotrexate: Results from a randomized double blind controlled clinical trial. BMC Musculoskelet Disord 2017; 18(1): 310. [http://dx.doi.org/10.1186/s12891-017-1673-3] [PMID: 28724365] ]. 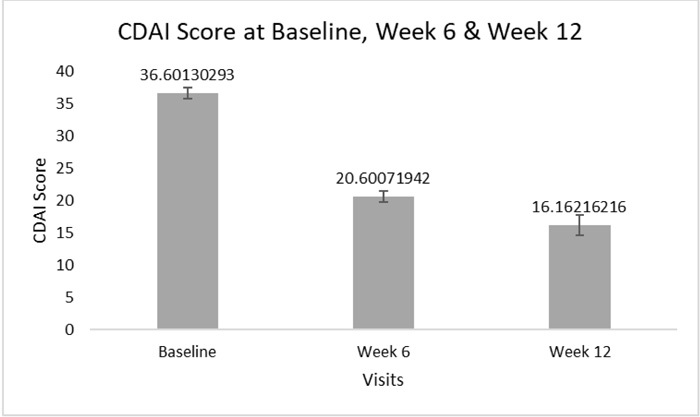 Interim analysis results from CLEAR study showed that active rheumatoid arthritis Egyptian patients treated with leflunomide for 12 weeks, whether as first-line or add-on medication, experienced a significant reduction in both CDAI score and HAQ-DI score. These results highlight that leflunomide may offer an effective alternative -with an acceptable safety profile compared to other DMARDs- for patients who experienced resistance to previous treatments, inadequate response or intolerance to other DMARDs. There is a need for additional research to assess the long-term efficacy and safety of leflunomide in the Egyptian population. This study was registered on clinicaltrials.gov (NCT03599986). Informed consent was taken from all the patients when they were enrolled. The author declare no conflict of interest, financial or otherwise. This study was funded by EVAPHARMA which took no part in the study design, analysis/ interpretation of the presented data. Data management, statistical analysis and site monitoring activities were provided by DATACLin Contract Research Organization. Editorial support was provided by Omnia Aboutaleb and Maha Abulfetoh on behalf of DATACLin Contract Research Organization and was funded by EVAPHARMA. We would like to thank the study PI, Dr. Adel ElSayed, and all the participating physicians for their contribution in this study. (In alphabetical order); Dr. Abd El Monim Hilal, Dr. Ahmed Al Shambky, Dr. Ahmed Fathy Abou Gamal, Dr. Alaa Labib, Dr. Al-Shayma Owila, Dr. Amin Abd El Hamid, Dr. Amira Elgerby, Dr. Ayman Farouk Darwish, Dr. Aziza Sayed Mohamed Omar, Dr. Dahlia Abd El Mohsen, Dr. Dalia Fayez, Dr. Ehab Ibrahim Abou El Oion, Dr. Esaam Abda, Dr. Fatema Ali Elshabacy, Dr. Manal El Tayel, Dr. Mohamed Attia Mortada, Dr. Mohamed Elwakd, Dr. Mohsen El Shehaly, Dr. Nevine Mohannad, Dr. Ragaa Abd El Kader, Dr. Samah El Bakry, Dr. Samia Zaki, and Dr. Sherif Refaat Mohamed. Ignatavicius D, Workman M, Rebar C. Medical-surgical nursing: Concepts for Interprofessional Collaborative Care 9th ed. 9th ed.2017. Mathur R, Singh H, Arya S, et al. Comparative evaluation of efficacy of leflunomide versus combination of methotrexate and hydroxychloroquine in patients of rheumatoid arthritis–An Indian experience. Indian Journal of Rheumatology 2016; 11(2): 86-90.